Who can evade an inevitable reference to Charlie Brooker’s Black Mirror while speaking about technology and dystopic future? 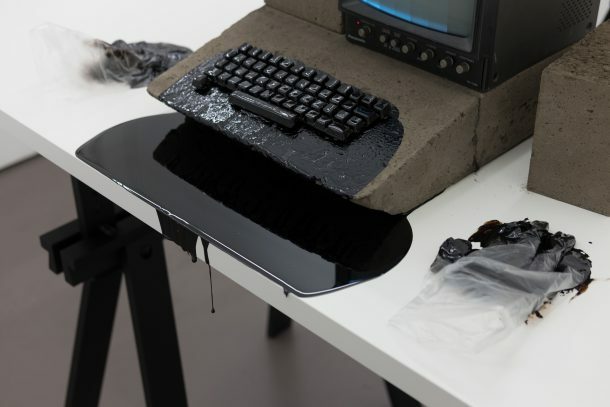 It is tempting to compare American Artist’s exhibition Black Gooey Universe at HOUSING gallery to Black Mirror, even though the connection risks limiting the vastness of the former’s critical engagement with technology to a Netflix series. But perhaps it only serves to drive American Artist’s point that the power of white supremacy allows white mediocrity to be an unavoidable locus of comparison as it continues to occupy society’s most visible platforms. Black Gooey Universe might bear a superficial resemblance to Black Mirror due to their similarly stylish glossy surfaces and criticality of technology’s evolution. However, Black Mirror maxes out its relative “wokeness” in its casting of interracial relationships and that one “Black Museum” episode, while repeatedly failing to account for whiteness’s complicity as the mastermind of a hopeless future. Contrary to the show’s myopic technophobia, American Artist embraces the idea of an end to a world that, from its inception, was built upon anti-blackness. After the apocalypse of the white world as we know it, embroiled with capitalistic showroom websites that increasingly mimic the elite white cube art space, what, then, might the dark screen flicker with, if anything? 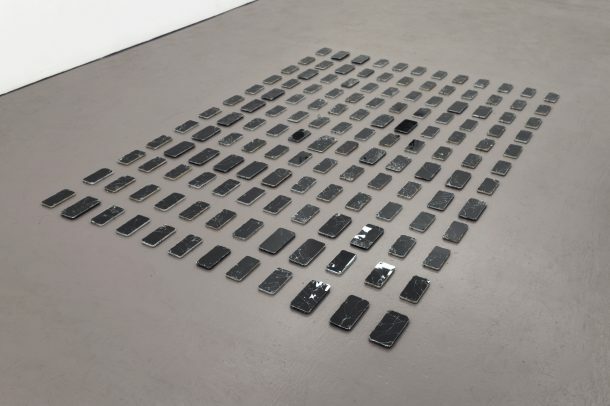 The first room in HOUSING presents No State (2018), a grid of over a hundred black iPhones with shattered screens. In an essay for the latest issue of Unbag that makes reference to Afro Pessimists Jared Sexton and Frank Wilderson, American Artist further contextualizes the black screen as a metaphor for Blackness: “Racial Slavery—which generated Blackness as a site of permanent extraction, gratuitous physical violence, and social death—provided the material and ideological basis for the United States. Unsurprisingly, Silicon Valley advances this constitutive anti-blackness through its technological products and processes.” The analogy of Blackness to devicehood evokes organized seizure, mass exportation, and abuse as exemplified by the Transatlantic slave trade. In this context, the broken device, with its defunct glass screen, is an unmistakable metaphor for Black people and the ways in which their bodies circulate in the possession of privileged hands. A series of prints, What is the Being of a Problem?, further pushes the idea of Blackness within society’s refuse, but also associates it with a seemingly infinite depth. American Artist has photographed how darkness exists in crevices and cavities in technology from the 90’s and onward, inside cracked plastic monitors and vacant screens. As the saying goes, if you stare long enough into the abyss, the abyss gazes back at you. The void’s intensity approaches that of Vantablack—the world’s “blackest” pigment that has recently been ironically trademarked and owned by Anish Kapoor, who does not identify as Black. American Artist further tells us in Unbag that in “All Black Everything,” Jared Sexton argues, “Black, I contend, is something that is involved in all appearance, all existence, and all signification because it relates to their common conditions of possibility and emergence, which is to say it relates, for the same reason, to the disappearance, inexistence, and insignificance of everything and of all things.” Despite the united front to suppress its presence and autonomy, Blackness, as captured in these works, is coupled with an inherent rebellion and survival against the odds. Blackness takes a taller form in Untitled (Too Thick) (2018), which extrudes multiple iPhones to unexpected heights. 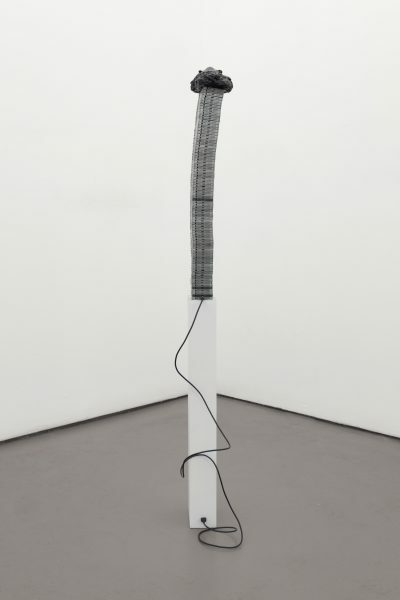 The antennae-like silhouette that bows with a slight curve recalls the form of David Hammons’s Higher Goals (1983/86), an installation of abnormally tall basketball hoops that critiqued the aspiration of “making it” in sports as an end goal. 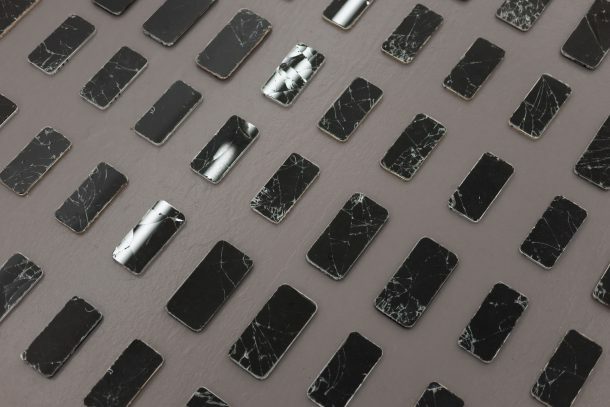 In an inquiry on what new heights should be, American Artist explains, “I was thinking about the collection of phones kind of ‘hive-minding’ or their power and processes being combined for a more powerful device.” Here perhaps it is again generative to contrast American Artist’s work to Black Mirror as a prime example of the different role that technology plays in white dystopia; in the episode “Hated in the Nation,” social media backlash is portrayed as bees who attack white victims. The hive mind, like Beyoncé’s followers known as the “beyhive,” is seen as a threat to whiteness, while American Artist instead sees it as directly complementary to fragmented, disempowered Black community. What other substances and forms does Blackness take, particularly online and behind a screen that is so insistent upon erasing it? 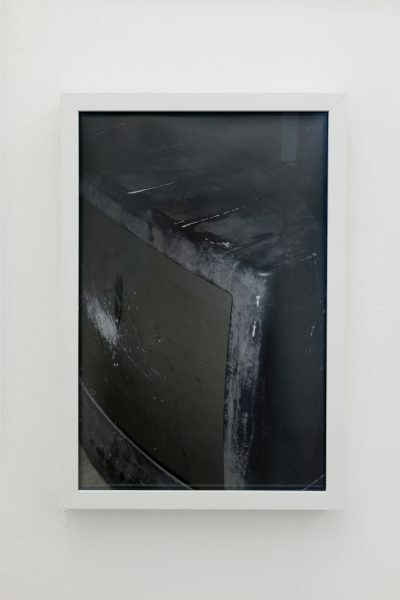 In the back gallery, Mother of All Demos (2018) consists of a Panasonic monitor on cinder blocks with mysterious black fluid oozing from the keys. Recalling the language of Primitivism that assigns antiquity to Blackness, American Artist also investigates the haunting presence of Black motherhood. On either side of the keyboard, plastic gloves retain the same viscous material, indicating the once-present body dripping with it. With the computer as a metaphor for modernity, American Artist makes real the way in which modernity is messily “birthed” from black labor. Hortense Spillers posits how Black femininity specifically is vestibular to culture in Black, White and In Color: Essays on American Literature and Culture by describing the myth of the black woman as “the primary receptacle of a highly profitable generative act.” Spillers compares Black women to the slave ships that carried them: a vestibule that forms a passage between the non-human and the human world. Blackness is not only the origin of all things and O.G. creator of technology, but it is also its physical interface; the hidden DNA within technology to which its output does not serve. Through their multiple studies that follow Blackness’s role in technology as we know it, American Artist ultimately reveals its inherent presence there. If Afro Pessimists view Black life as something that has been so alienated from all notions of state and society that it can only reside in an alternate realm, underground or in outer space, does this not perfectly describe the higher dimensions that technology creates? From Alondra Nelson and Kali Tal to Juliana Huxtable and Aria Dean, Black scholars and artists have suggested that the notion of fragmented self has been a longtime experience of the African diaspora even before the digital age; the duplicity of identity, in the Du Boisian sense, is a form of resistance and self-preservation under state control and subjugation. The robot gaining sentience after being exploited for free labor has long represented the revolutionary–rarely is this manifest in mainstream narratives as the Black revolutionary. American Artist, whose own legal name reflects an initiative to control their own searchable online visibility, makes us see the unseen. Tags: American Artist, Black Gooey Universe, Black Mirror, David Hammons, Frank Wilderson, Hortense Spillers, HOUSING, Jared Sexton. Bookmark the permalink.